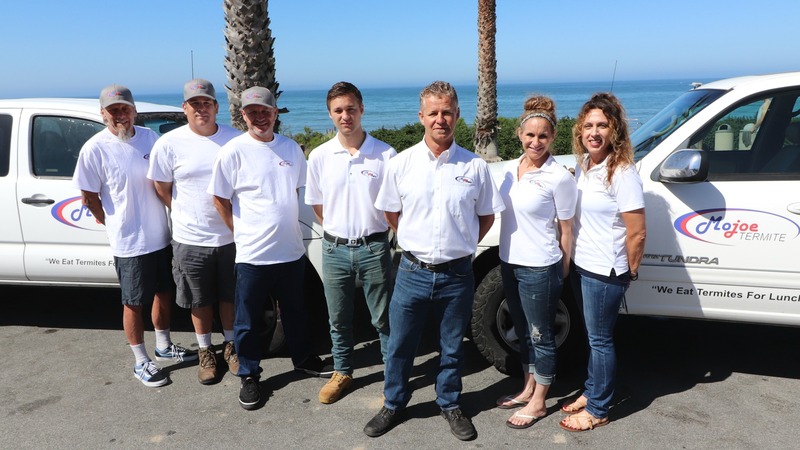 Mojoe Termite has been proudly serving San Luis Obispo with termite control, termite inspections and termite fumigation since we started the company back in 2008. We are one of the only pest control companies in San Luis Obispo County that specializes in wood destroying organisms. That means we work exclusively in the eradication of termites, wood fungus, carpenter bees, and specific species of beetles. More than 600 thousand homes in the US experience termite problems annually causing 5 billion dollars in termite-related property damage every year. Termites never sleep, so the longer you wait, the more they reproduce and the more damage they cause to your home. 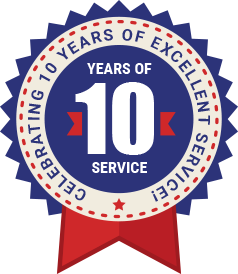 Our termite control services include a 6-year guarantee on our tent fumigations for Drywood Termites as well as our Subterranean Termite treatments. We promise that you’ll be free of termites or we’ll come back to fumigate or Sub-treat your home again for free. That is the best termite control guarantee in San Luis Obispo County. One or two other local companies may offer a five-year guarantee on their tent fumigations. However, the vast majority of companies only offer two or three-year guarantees on their fumigations and Subterranean Termite treatments. Call today to schedule a termite control inspection or a FREE termite fumigation estimate at (805) 548-8990. A termite inspection is usually the first step to take in protecting your home from the damage caused by termites and other wood destroying organisms. During the inspection, Joe or Reagan will look for evidence of termites or other wood destroying organisms such as dry rot, carpenter ants, carpenter bees, and wood boring beetles. This involves climbing up into the attic of the home and even crawling under the home if it has a sub area. The inspector will report evidence of these organisms, damage caused by the organisms, and conditions on your property that could create a vulnerability to damage by these organisms. 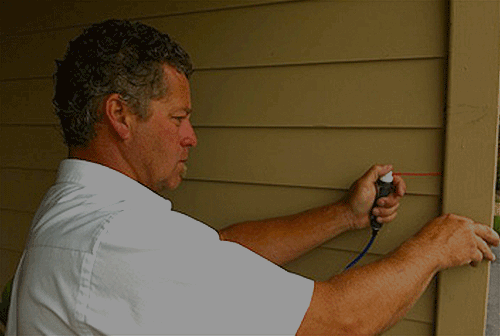 You’ll receive a termite report along with a written estimate to give you the information necessary to make a smart decision about the best approach to protect your home. We charge $97 for our termite inspections while some pest control companies provide termite inspections for free. This is definitely a case of where you get what you pay for. 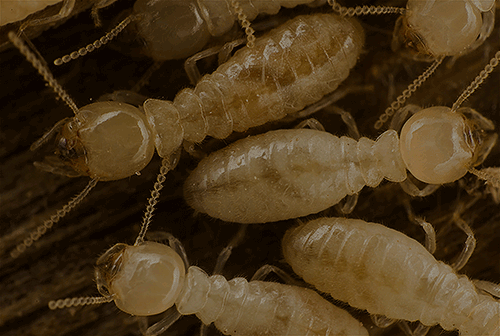 A local termite control treatment can be effective if your property has one or two small areas of Drywood Termite infestations as long as the areas are completely accessible to treatment. It’s very important to get the local termite treatments done before the termite infestation gets a chance to spread it inaccessible areas of the home. Wait too long and fumigation may be necessary to ensure that all the termites are exterminated. Subterranean Termites live in the ground and get into the home when wood is touching the ground, there are cracks in the foundation, or when they build mud tubes that reach up to the wooden areas of the home. Subterranean Termites can travel hundreds of feet through the soil to get to your home and they are attracted by heat and moisture. That’s why we often find Subterranean Termites near leaky plumbing, water heaters, and other heaters. Once we locate the location where the termites are entering the home, we treat the area and the soil beneath the area with an application of Termidor (fipronil). 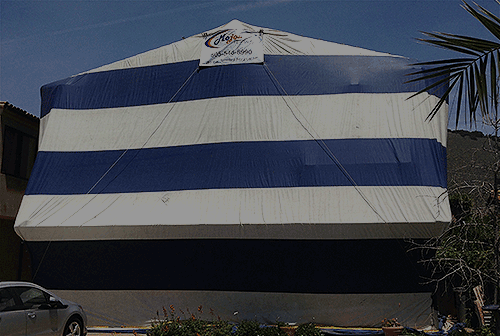 The primary recommendation for exterminating Drywood Termites from a structure is tent fumigation. The treatment required cover the structure with special tarps before introducing Vikane Gas Fumigant (Sulphuryl Flouride) into the structure. The gas penetrates the wood in the structure and eliminates all of the Drywood Termite colonies that were living in the structure. If you think you are seeing evidence of Drywood termites, such as sand size wood pellets, hollowed out wood, or you have a swarm of termites in your house, you can call us for a free fumigation estimate. We’ll tell you if you actually have termites and we’ll give you a written estimate for how much it will cost to tent the home. If your termite inspector finds damage to your home caused by termites or wood fungus, we can provide you with a bid to repair the damage for you. 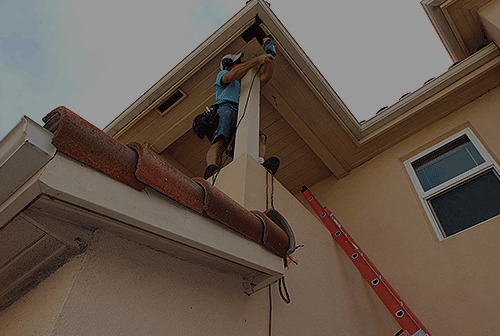 Our crews do this type of work all day long so they know how to make the repairs quickly and professionally at a very reasonable price. 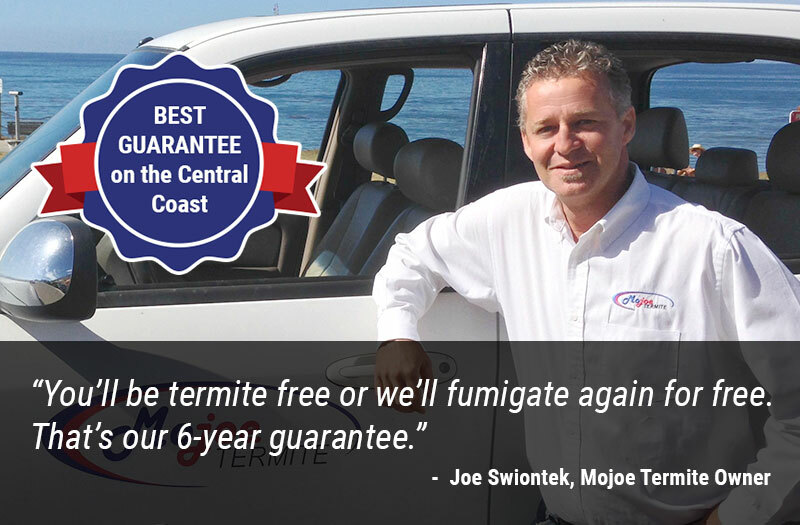 The Leading Real Estate Agents and Brokers in San Luis Obispo Call Mojoe Termite… Maybe You Should Too!